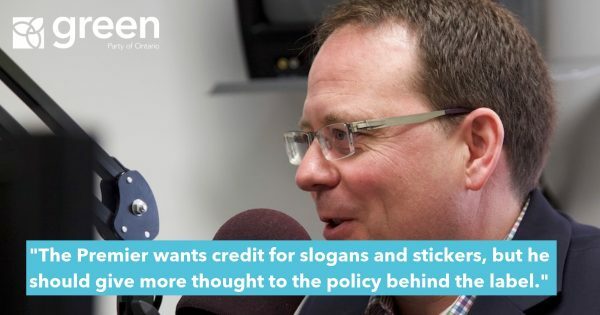 Green Party of Ontario Leader Mike Schreiner accused the government of cheap talk and no action on pressing environmental issues that affect our communities and our quality of life. The Environment Commissioner Ontario’s (ECO) annual report raises serious concerns about the government’s failure to divert waste, protect species at risk and clean up the Great Lakes. The ECO report shows that waste diversion in the industrial, commercial and institutional sector has remained constant for a decade. With a diversion rate of 23 percent, the province has failed miserably to meet its 60 percent diversion target. Schreiner shares ECO concerns that the Ministry of Natural Resources and the Ministry of Environment don’t have the resources to monitor developments such as the Melancthon mega-quarry that threaten our water and natural heritage. “In tough financial times, we need creative solutions that won’t affect general revenues. The Green Party supports increasing the ridiculously low fees for mining aggregates to fund monitoring and land rehabilitation while encouraging re-use and recycling,” said Schreiner. Ontario’s fees for mining aggregates are only 11.5 cents/tonne. By comparison, fees in the UK are equivalent to about $3.40/tonne. Schreiner is pushing the government to partner with landowners to deliver low-cost solutions that protect endangered species. The Green Party supports policies, like a safe harbor program, to encourage landowners to voluntarily take steps to protect endangered species.